For more than 20 years the Heritage Fund has made a difference not just to wildlife conservation efforts, but also to the state’s economy, public access, environmental education and outdoor recreation. Passed by voters as a ballot initiative in 1990 by a 2-1 ratio, the fund provides up to $10 million each year from Arizona lottery proceeds to the Arizona Game and Fish Department for the conservation and protection of the state’s wildlife and natural areas. The Heritage Fund is used to protect endangered species, acquire habitat for the benefit of sensitive species, provide access to outdoor recreational opportunities, and educate children and adults about wildlife. 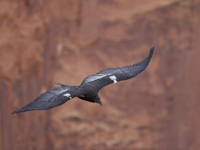 Because the department receives no state tax dollars to cover its operating budget, the Heritage Fund is critical to recovering or sustaining Arizona’s unique native wildlife and to managing more than 800 species. The fund’s impact is multiplied through its use as a match for federal dollars. 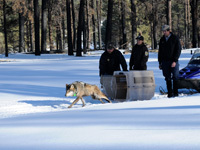 Black-footed ferrets, California condors, Mexican wolves and black-tailed prairie dogs – all species that had disappeared from the state – have been reintroduced into Arizona. More than 640 Heritage grants have been awarded totaling more than $14 million for wildlife, outdoor recreation, and environmental education projects statewide. The Bald Eagle Nestwatch Program – a nationally-recognized effort – has played a key role in helping the state’s bald eagle population grow by nearly 600 percent since the species was listed as endangered in 1978. Landowners enrolled more than 22,000 acres in a statewide program to conserve endangered Chiricahua leopard frogs. 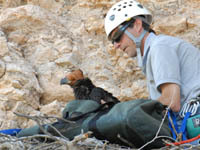 Implementation of a voluntary non-lead ammunition and hunter outreach program to enhance California condor conservation. Native Apache trout have been recovered to a point that the species has been downlisted from endangered to threatened, and limited fishing opportunities are allowed. Research has identified critical wildlife corridors to be considered in future construction of the state’s roadways to help maintain pathways for wildlife to move to seasonal foraging grounds and prevent populations from becoming isolated. This research has also aided in introducing measures to decrease wildlife-vehicle collisions on Arizona’s roads. 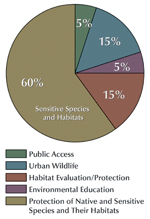 Heritage funding contributed to the acquisition of nearly 18,000 acres for public enjoyment and wildlife conservation, and establishment of the Becker Lake Wildlife Area (Apache County), Whitewater Draw Wildlife Area (Cochise County), Verde River Wildlife Area (Yavapai County), and Quigley Wildlife Area (Yuma County) for habitat conservation and species recovery programs. Barrier-free fishing piers have been constructed at Woodland, Mittry, Patagonia, Kaibab, Riggs and Rose Canyon lakes. Schoolyard habitat projects have been awarded the “Governor’s Pride” and Westmarc’s “Best of the West” awards. The Arizona Quality Alliance recognized the Urban Fish Stocking program with its Showcase in Excellence award for its efforts to provide urban recreational opportunities to the public. Bald eagle, california condor, mexican wolf. The Heritage grants are supported by revenue from Arizona Lottery sales and are available to projects that focus on wildlife, including wildlife education, schoolyard habitats and wildlife conservation efforts. In addition, there is a grant category geared towards helping schools fund field trips that take students outside to learn about wildlife and outdoor recreation. Potential grant recipients must have a project that is either located in Arizona or involves research in which the wildlife or its habitat is located in Arizona. Learn how to apply for a Heritage grant.